You can better enjoy each story if you click on the title of a story in the bulletin where you'll be taken to the story on our website, displayed in easy-to-view full-page format. As usual, there was a lot going on at the Chiang Mai International Rotary Club (CMIRC) during the month of September. I will discuss many of these activities below, but I would like to begin my President’s Message this month with what I consider to be one of our greatest achievements thus far this Rotary Year. With the full support of the CMIRC leadership and under the guidance of Rtn. Mike Gholsun, our club is now the proud sponsor of the Chiang Mai International School Interact Club. Through its Interact Club Program, Rotary International has been seeking to sponsor service opportunities for high school youth worldwide. There are now over 20,000 Interact Clubs in 159 countries with nearly 500,000 members. Thanks to the great work by Rtn. Mike, the wonderful support from the Chiang Mai International School administration and staff, and the enthusiasm of the 16 Chiang Mai International School students who have joined the club; we are on our way to obtaining a Rotary International Charter for our new Interact Club. Interact clubs organize at least two projects every year, one that helps their school or community and one that promotes international understanding. Rotary club sponsors (CMIRC) mentor and guide Interactors as they carry out projects and develop leadership skills. CMIRC is very proud to sponsor this Interact Club effort at the Chiang Mai International School, and we look forward to many years of working together to serve and improve our Chiang Mai community. Rtn. Nick Dale, comes to us from South Africa, but he also has strong Irish roots. Rtn. Nick’s career was focused on logistics management in both the restaurant/food/beverage industry and in the airline catering industry where he worked for South African Airlines and LSG (Lufthansa). Nick says he joined CMIRC to “give back” and because he wants to become part of the Chiang Mai community. Soon-to-be Rtn. Clarence Shettlesworth, a citizen of the U.K., Rtn. Clarence has lived in Thailand for over 40 years. He reads, writes, and speaks fluent Thai. Most recently, he has been an adviser to the Thai Ministry of Justice, English Lecturer at the Faculty of Law at Chiang Mai University, and Regional Co-ordinator, SE Asia, University of Cambridge ESOL Examinations. Clarence joined the club with a strong interest in helping us seek charitable foundation support for our projects focused on child safety, health, and education. Our service project updates will be given by our project champions later in this Bulletin, so I will close with one last big item on the CMIRC president’s agenda—the visit on Tuesday, October 2 to CMIRC by new Rotary District 3360 Governor Roongranee Sangsiri. We have prepared a report on our club activities and we hope to have a good conversation about how CMIRC can continue to cooperate with the 65+ other clubs in our district. We are the only Rotary Club in Northern Thailand where English is the language used for all business. But, we at CMIRC have always felt completely welcomed by our Thai colleagues and look forward to discussing joint projects with other Thai clubs in our district. Furthermore, we feel confident our district will support our efforts this year to obtain a Rotary International Global Grant focused on children at the Mae Tao Clinic. As the reader of this Bulletin will see, CMIRC is doing a lot of great work in our Northern Thai community, especially if you consider that we only have 23 members! So, the message this month ends with an appeal to our readers. If you live in Chiang Mai or know someone who does, and you think they would be a good candidate for membership in our club, please let me know: john@cmirotary.org. If you wish to make a financial contribution to the CMIRC, please contact treasurer@cmirotary.org . 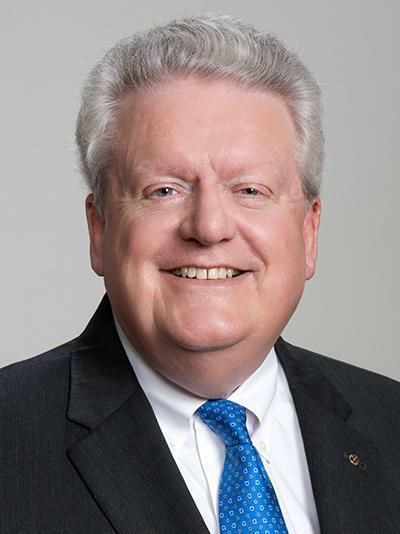 Once a year, globally in every Rotary District, the District Governor makes an official visit to each club in the district, between July 1st and December 31st. Tomorrow, October 2nd, DG Roongranee and her husband Khun Artit Sangsiri (shown left) will visit CMIRC. To allow the District Governor to communicate directly with all Rotarians in the District. To listen to the Club Leadership and gain better understanding of their club. To serve as a catalyst to help strengthen the programs of Rotary. To meet the requirements that Rotary International sets for serving in the office of District Governor. Prior to the District Governor’s visit (preferably prior to July 1st), Assistant Governors (AGs) will meet with the club officers to review the club’s Summary of the Club Plans and Objectives. The AG will meet with District Governor prior to his/her official visit to each club in that area. Additionally, the Assistant Governor for the area will work with the club leadership to confirm the meeting and accommodation arrangements. 1. Reconfirm at least one month in advance of the District Governor visit to resolve any questions as to the information, format of the visit and special requirements. 2. The District Governor is a guest of the club when making an official visit. Most importantly, the club should communicate special plans to the Governor and AG so as to be sure it fits in with his/her other plans. The District Governor, while serving as District Governor Elect, attends a week-long training seminar and has the opportunity to receive information from the RI President Elect. Values, vision and programs are reviewed at this time. During the Official Visit, the District Governor is required to share with all clubs in the district, the programs and their purpose. The District Governor and spouse are guests of the club for the Rotary meeting. Clubs are encouraged to include the spouses of the members at this special meeting. 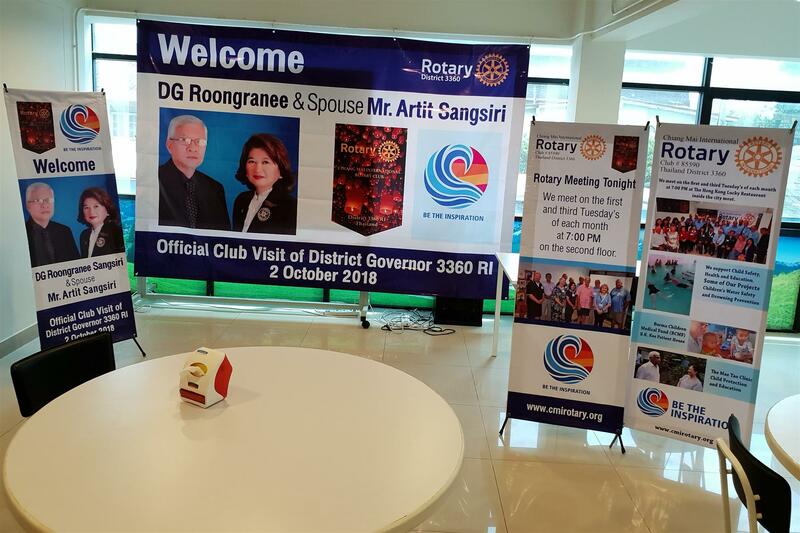 As you can see from the photo above, we've made some special banners to welcome the DG and her husband and to share stories about the projects of our club. The Governor’s presentation is the program for the club meeting and it is not appropriate to schedule any other program that day. Allow the DG a minimum of 20 minutes for the presentation. The Governor’s visit is a very special occasion and an opportunity for potential members, and members of the family of Rotary to learn more about Rotary. Clubs are encouraged to invite spouses or other business leaders. Encourage members to plan on arriving early for the meeting and staying late in order to meet with the District Governor. Presentations of Paul Harris Fellowships, inductions of new members and other honors are especially appropriate during the District Governor’s visit and the District Governor should be asked to participate in such events. Clubs are requested to discuss any contemplated changes for the official visits or the format with the District Governor so questions can be resolved early. The District Governor will wish to meet with the Club Board and Committee Chairs before or after the Club meeting. The meeting is open to any member of the Club who wishes to attend. Please allow up to one hour for this meeting. The Club President Introduces the Assistant Governor (AG), then the AG introduces the District Governor (DG) to the club. The DG’s bio should be used. If a club wishes to invite the District Governor and spouse to special events such as Club Anniversaries, club fund raising events, or changeover meetings, please consider them as your guests. The District Governor and spouse enjoy sharing in club activities. The District provides for their travel expenses. Leadership is an essential aspect of Rotary – and we offer both clubs and programs to help emerging leaders to develop their skills. Through these groups, participants strengthen their leadership skills, serve their communities, increase their world understanding, build friendships, and more. Interact is a club for youth ages 12-18 who want to connect with others in their community or school. Interact club members have fun while carrying out service projects and learning about the world. Interact clubs organize at least two service projects a year: one that benefits their community and one that encourages international understanding. While Interact clubs receive guidance from individual Rotary clubs, they govern and support themselves. There are more than 12,300 Interact clubs in 133 countries. Our club, CMIRC, is sponsoring the formation of a new English language Interact Club at the Chiang Mai International School (CMIS). The new club membership core is drawn from the CMIS Honor Society members. Rotarian Mike Gholson is our liaison with CMIS supporting the new club. Eighteen students attended the first meeting and during the second meeting they elected their club officers (right). They are currently completing paperwork to obtain their charter. 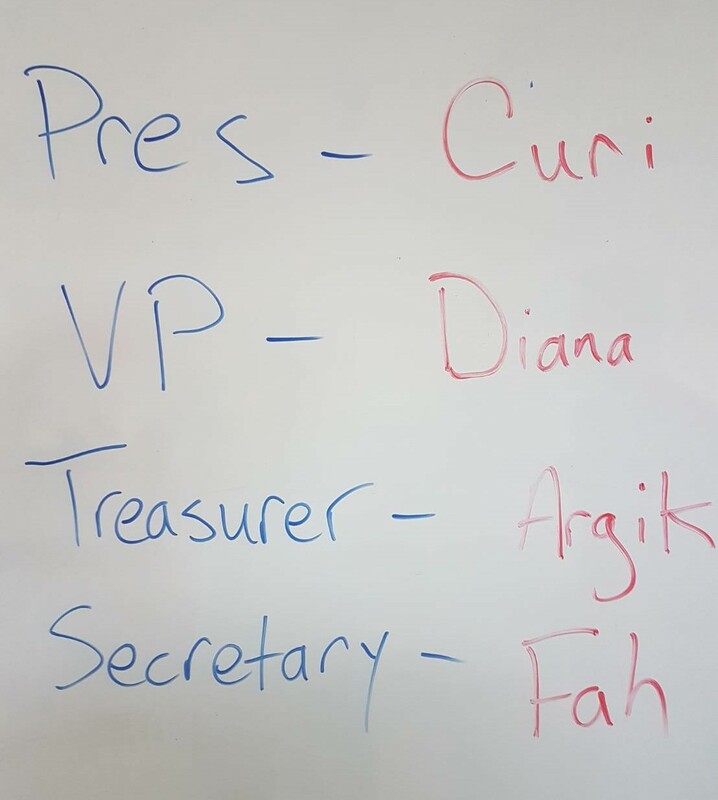 Four club officers and their two advisers will join in our meeting with the District Governor on Tuesday, October 2nd, at which time we should have a final headcount of the founding members of the new Interact Club after their meeting on October 1st. You can see what other Interact clubs are doing around the world on Facebook and visit Interact’s YouTube channel. CMIRC-Kru Payu Swim Children’s Water Safety and Drowning Prevention Program: The month of September saw the completion of CMIRC-funded survival swimming and water safety programs in Chiang Mai for fourth-grade students at the Wat Pa Paang Municipal School and the Wat Chiang Yuen Municipal School (relaxed student at right). We have now completed survival swimming and water safety instruction for 8 of the 11 municipal schools in Chiang Mai. We will complete the 10-lesson, 15-hour training program for the remaining 3 schools in the municipality during November and December of this year. 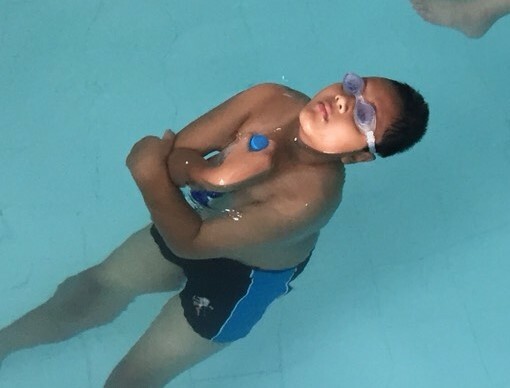 So, once again this school year we will be able to say that every graduate of the eleven Chiang Mai Municipal Schools will have had the opportunity to learn survival swimming. Oz Swim Aquatics of Brisbane Australia Training and Certification Visit: Eve Fraser, Director of Oz Swim Aquatics has informed Kru Payu, CMIRC, and Rotary Club of Patong Beach that she will bring a team of three internationally recognized swim instructors to do additional training for swim instructors in our Chiang Mai and Patong Beach programs. We also plan to invite instructors from our Rotary Club Lampang program to join us here in Chiang Mai for training. The Oz Swim Aquatic Team will be in Chiang Mai from November 11 to 17 and in Phuket from November 18 to 24. They will offer 8 hours of instruction at no charge and Swim Australia/Australian Swimming Coaches and Teachers Association International Certification for those who choose to pay the certification fee. CMIRC-Safe Child Thailand has agreed to pay the international certification fee for our 4 lead instructors. This is a much needed training opportunity for our swim instruction staff and Oz Swim Aquatics has only asked for room and board for payment. Kru Payu TV Appearance: Kru Payu, the director of Kru Payu Swim, appeared on MCOT Family Network (Channel 14) Morning Market Show to discuss water safety and drowning prevention. The show aired on Thursday, September 27 at 8am. Kru Payu did a great job describing the problem and he gave very prominent mention to the Chiang Mai International Rotary-Kru Payu Swim free program for teaching survival swimming and water safety. The mention of Rotary and “free” got a few approving oohs and aahs. Australian Aid DAP Grant: The Australian foreign aid department solicits grant proposals from developing countries worldwide for program aid. This year CMIRC has applied for a grant of 350,000 Baht to fund the expansion of the Children’s Water Safety and Drowning Prevention Program in Phrao (working there with the Warm Heart Foundation), and at the BanYa Learning Centre (for Burmese refugee children) in Phuket (working there with the Rotary Club of Patong Beach and the British International School). We will know in November if we are awarded a grant. Sad News: Finally, the children of Thailand and the Safe Child Thailand-Rotary Club of Patong Beach Children’s Water Safety Program lost a great man this month. PP Larry Amsden of the Rotary Club of Patong Beach has passed away. Larry is the reason CMIRC and Safe Child Thailand chose Patong Beach for the Safe Child Thailand-funded swim project expansion. He will be greatly missed by his Rotary colleagues in all of Thailand and by all the swim instructors from Chiang Mai and Phuket who he organized to make the Patong Beach project a great success. It's a real joy each each week to visit the Burma Children Medical Fund's (BCMF) B.K. Kee Patient House in Chiang Mai with Mike Lake and Roger Lindley. We would be happy to have others join our team! During September, we had a lot of fun practicing English with a variety of patients and their families. There were two younger children one week and a baby returning from the hospital with his mother on our last visit of the month. Most patients were teens or older staying at the House. We were happy to see that the trend continued of patients completing treatment successfully and returning home, including a young teen with breathing problems through his trachea. Also a little girl with left eyelid tumor, 4 years old, from Myawaddy and her mom (below left). Another frequent patient who was in Chiang Mai for heart surgery was all dressed up, wearing a tie (below right). We have had another visit by a great young man in a wheel chair. He is not a patient but stays at the house during school breaks. 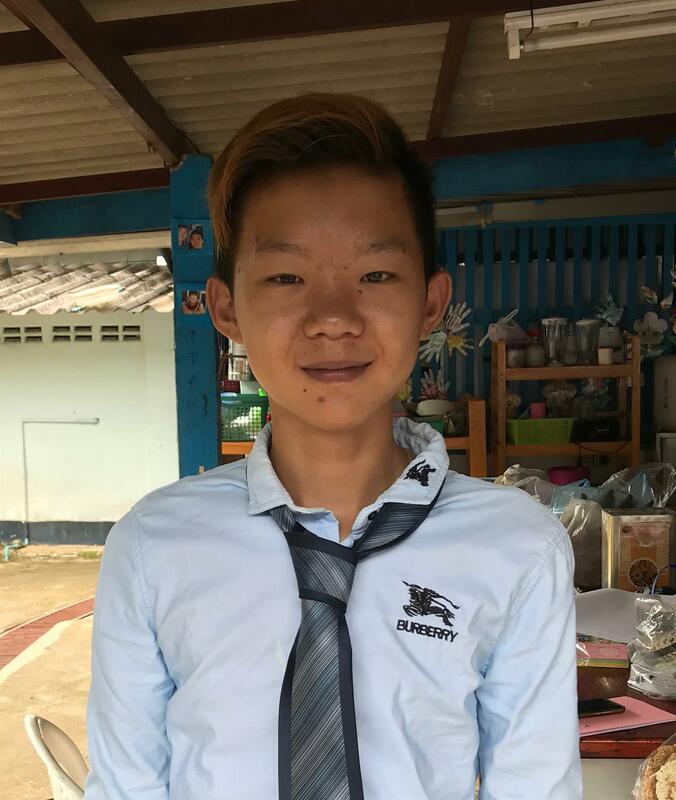 He is studying business & computers in Mae Hong Song & wants to eventually open an internet shop. Mike Lake and I purchased some needed supplies including soap and shampoo dispensers with refills for the shower room. Our construction helper Mit, who was born in Burma himself, did a great job at replacing damaged shelving, repairing safety grates with some clever welding, fixing doors that had swollen due to rain and burying a wire for the entrance lights in concrete. The signing of a Memorandum of Understanding between the CMIRC and BEAM (Bridging Education Access to Migrants) will take place on Monday, October 1 at the BEAM offices in Chiang Mai. This will officially launch and formalise the CMIRC Cultural Exchange Club project at BEAM. Approximately 15 individuals are expected to attend, including CMIRC President John Schorr, Rotarians participating in the project and the BEAM director. Cultural Exchange Club sessions will begin shortly after the signing ceremony. 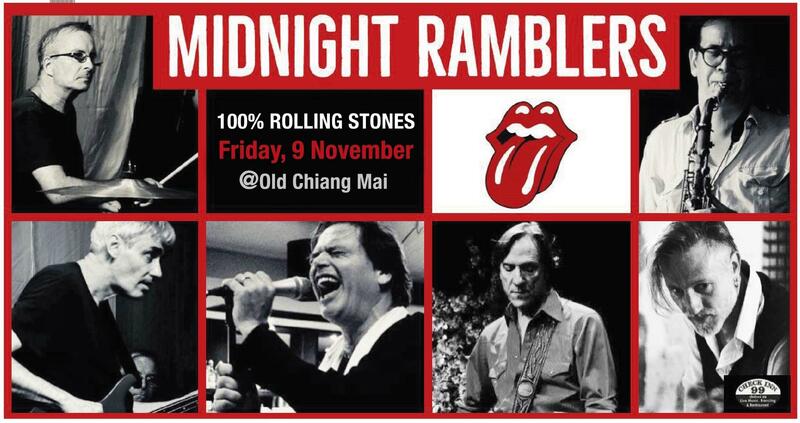 Children's Charity Concert, featuring Bangkok-based Rolling Stones Tribute Band, "The Midnight Ramblers, with Joe Cummings. Proceeds to benefit the Children's Chairty Projects of CM International Rotary Club. Pern's Restaurant will bring to you the sounds, sights and styles of the many people of Myanmar while you enjoy a ten-dish taster menu of various specialties from the different regions of Myanmar. You may make new friends, since seating will be in the style of Myanmar, at large tables. Limited seating for this one-time-only event, so please book early. A deposit of 200 baht per person secures your reservation. Tuesday October 30th 2018 at 7 p.m., 600 baht, plus special raffle to benefit the children's charity projects of CMI Rotary Club at Pern's Restaurant, Huay Kaew Road (opposite the Shell Station). Please book on line at https://www.pernsfood.com/bookings.html (stating the booking is for this event!) or call 0861117766 - or drop in the restaurant after 5pm Tuesday to Sunday to book in person. Recently we welcomed a new member to our club, Nick Dale and he expands the International scope of our group, coming from South Africa. So far, he's had 100% Perfect Attendance, too, participating in several service opportunities and committee meetings. Congratulations, Nick! And we recognize Geoff Perry, one of our Australian members, for taking leadership with the Winter Clothing Appeal. It's good to see true International participation in the club. Each quarter I like to recognize members who had 100% participation, perhaps because my husband, Roger, came from a club in the U.S. that prided itself on 100%-100% participation. It was a small club, like ours, and equally as active, with many other Rotary clubs nearby, so there were opportunities for "make-up" sessions if you couldn't come to a meeting. (Sounds like Chiang Mai, doesn't it?) His club had great spirit, probably because of their 100%-100% "rule". It gave everyone a wonderful opportunity to get to know the neighboring Rotary clubs and to attend meetings of club committees, even if they weren't members of that committee. Think about it, if you find you aren't aren't on the list below. For the 1st Quarter (July-Sept) the club members with 100% attendance are: Nick Dale, Maliwan Kaew-Amphai, Mike Lake, Nancy Lindley, Roger Lindley, Jerry Nelson and John Schorr. Several of these folk obtained 100% attendance through committee meetings and John Schorr went to the RI International Convention. Many hands make for light work. Please think about becoming more involved with the club if you aren't. 1. Building the capacity of entrepreneurs, community leaders, local organizations, and community networks to support economic development in impoverished communities. 2. Developing opportunities for productive work. 3. Reducing poverty in under-served communities. 4. Supporting studies for career-minded professionals related to economic and community development. Nearly 800 million people live on less than $1.90 a day. 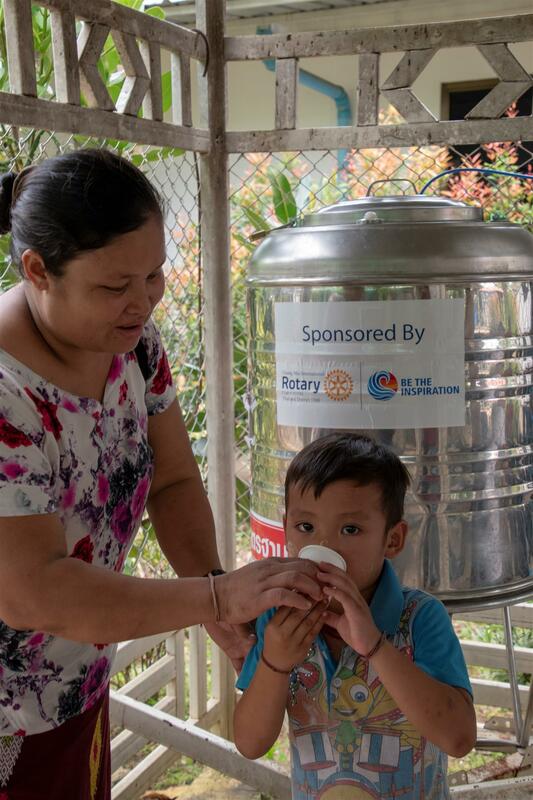 Rotary members are passionate about providing sustainable solutions to poverty. Our members and our foundation work to strengthen local entrepreneurs and community leaders, particularly women, in impoverished communities. We provide training and access to well-paying jobs and financial management institutions. Our impact on local economies: Rotary members train people to become resources for their community, offering networking activities, advice on new business development, and mathematics and financial management training. Breaking the cycle of poverty for women: Most of the women living in rural Guatemala do not have the collateral to get loans from regulated financial institutions. The Rotary Club of Guatemala de la Ermita helped 400 local women complete financial literacy courses so they could pool their money and fund their own micro-lending program. Sustainable farming: In west Cameroon, soil erosion and loss of soil fertility have significantly reduced farmers’ harvests. Rotary members gave farmers the skills they needed to improve soil fertility, control soil erosion, and market their produce. The results -- increased crop yields and profits. 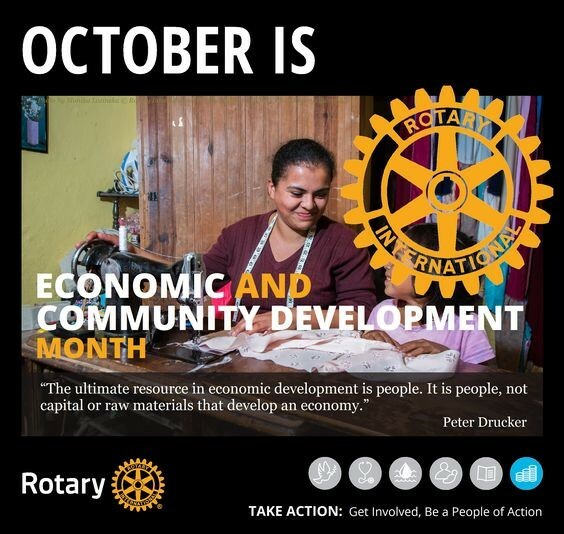 $ 9.2 million - The amount The Rotary Foundation has spent to grow local economies and reduce poverty last year. 795 million people — or 1 in 9 people in the world — do not have enough to eat. 60% of the world’s hungry people are women and girls. 70% of the world’s poorest people live in rural areas and depend on agriculture and related activities for their livelihood. 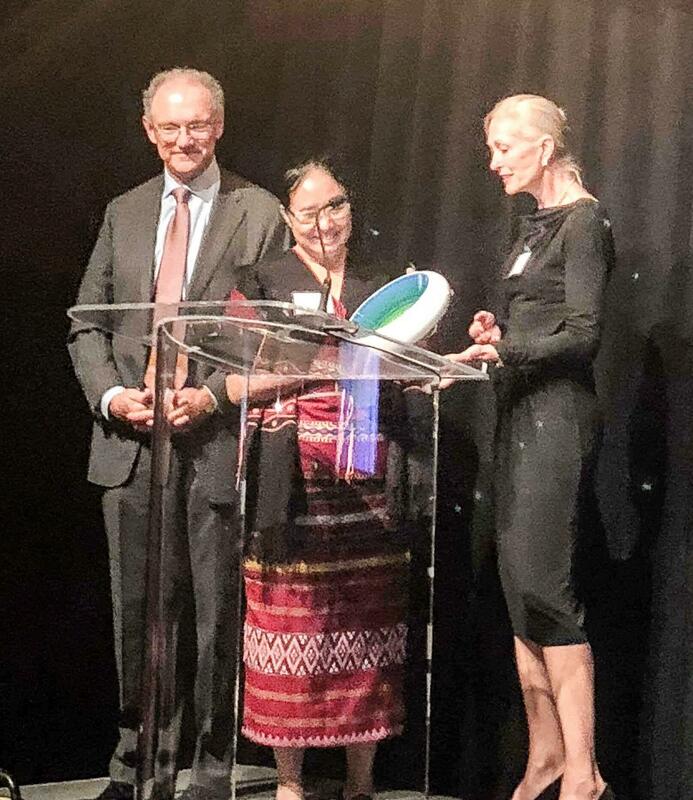 We are delighted to announce that on September 26th, Dr. Cynthia Maung, founder of the Mae Tao Clinic was awarded the 2018 Roux Prize at a ceremony in Washington DC, U.S.A. Since the founding of CMIRC we have supported the Mae Tao Clinic and Dr. Cynthia in a variety of projects. The Roux Prize was established in 2013 by David and Barbara Roux (shown right, with Dr. Cynthia) to award innovation in the application of disease burden research and is awarded in cooperation with the Institute for Health Metrics and Evaluation. The prize recognizes the person who has used health evidence in bold ways to make people healthier. We sincerely appreciate the acknowledgement of David and Barbara Roux for the work of Dr. Cynthia, and her staff and partners. It truly is a great honor for the health services provided along the Thai-Burma border to be recognized in this way. The Roux Prize team recently visited the Mae Tao Clinic to produce a special video, which presents how data from the clinic's health information systems are practically utilized to address health issues and thus bringing positive change to our community. Water Tank Project Re-Visited: Usually, a government hospital or clinic in Burma or Thailand does not provide free drinking water to other than inpatients. 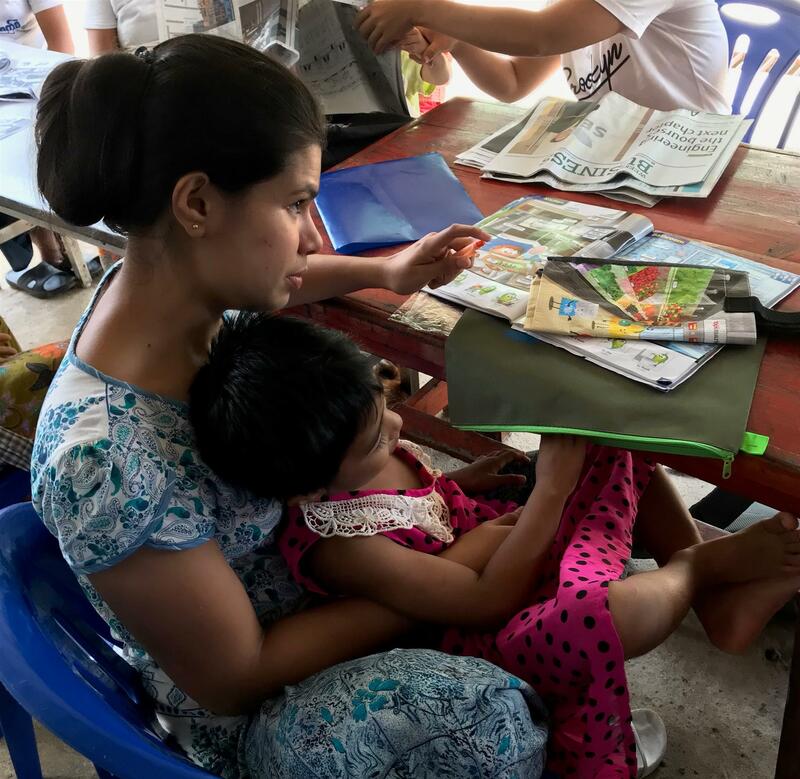 The Mae Tao Clinic clients are typically extremely poor Burmese migrants or day travelers who cannot afford to buy a bottle of water for their children or for themselves. In late 2016 and early 2017, CMIRC conducted a fundraiser and has financed ten water tanks and eight sets of water filters which are placed at various locations around the campus. During our most recent visit, we finally got around to putting Rotary stickers on the water tanks. But, much more important is that children and their families at Mae Tao Clinic now have clean drinking water at no cost, thanks to the generosity of our wonderful donors and the Mae Tao Clinic Staff. Mae Tao Clinic Tour, planned for 21 November – 25 November 2018: The August tour was a great success. We plan to model the November tour after it with a couple of additional features. 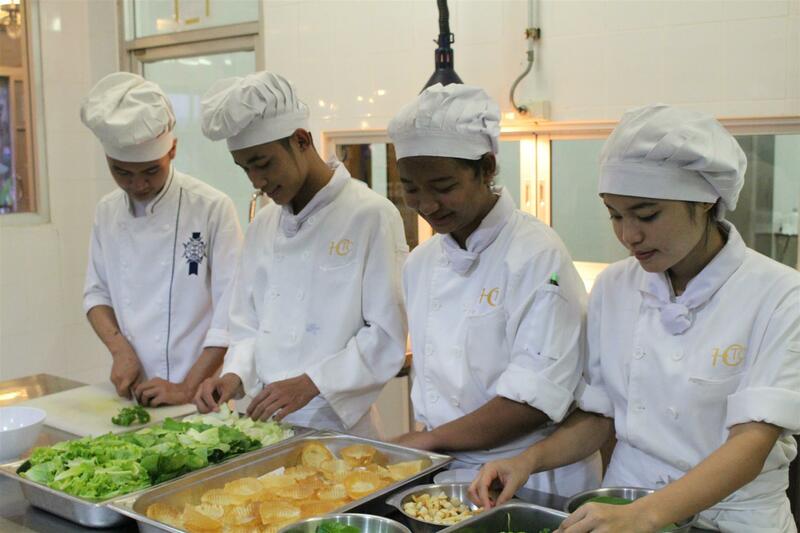 We will be there on American Thanksgiving, the 22nd of November and plan to enjoy dinner at the Hospitality & Catering Training Center, Mae Sot. (students pictured at right) Their mission is to support underprivileged and marginalized youth. From experience we know they will go a great job. And also, just by chance, 23 November is the Thai holiday Loi Krathong; we are fortunate to be in Mae Sot for this beautiful holiday. Mae Tao Clinic Fundraising Event, 7 December 2018: In conjunction with BABSEACLE’S Access to Justice Week there will be a Fundraising event at the Amora Hotel. The format will be dinner and a movie, the film being “Isthmus”. For reservations or info: email 7decevent@cmirotary.org. Details will be in the November and December bulletins. See the "Save the Dates Article Below" for these and other important opportunities. Yes, it’s true, my fellow Rotarian, the future of this club is in your hands, and mine and those of all our good members. The theme for this year, “Be the Inspiration” is a perfect reminder and begs to ask the question: What are we going to do about it? One of the stated advantages of being a Rotary member is that we are given opportunities to develop as leaders. This means that many participate in club leadership and perhaps district and beyond. Do you think that RI President Nominee Mark Daniel Maloney (shown right), of the Rotary Club of Decatur, Alabama had any idea of his destiny when he joined Rotary in 1980? All of this is set in the scenario of a perfect world, one in which we do not visit, never mind reside. We make do with what we have, we continue to box above our weight; our CMIRC culture is to win. That requires rolling up our sleeves and demonstrating that we live in “Service Above Self”. President is really a 3-year commitment with recommended 1-year board experience prior. Remember the President Elect normally becomes the President. The President becomes the Immediate Past President. CMIRC bylaws recommend the President Nominee have a year of experience on the board prior to being elected, if possible. Our club culture is to not ask anyone to serve a second term as president although many club presidents have told me that a two-year term is better for all concerned. There is a heck of a learning curve! The CMIRC bylaws suggest that the Secretary, Treasurer and all Directors serve for 3 years if possible. Personally, my feeling is that we do this one year at a time. There are procedures in place for elections, but we are not yet at a place where we have more than one Rotarian wanting to do any given job. The incoming president asks the Rotarian if he/she wants to serve during the upcoming year. If we accept, we suit up, show up and do the job! Along the way we ask ourselves if it’s best for all concerned to continue for a 2nd or 3rd year. All the members of CMIRC are good people and we all have different paths, different challenges and different abilities. Please think about your own position in this club. 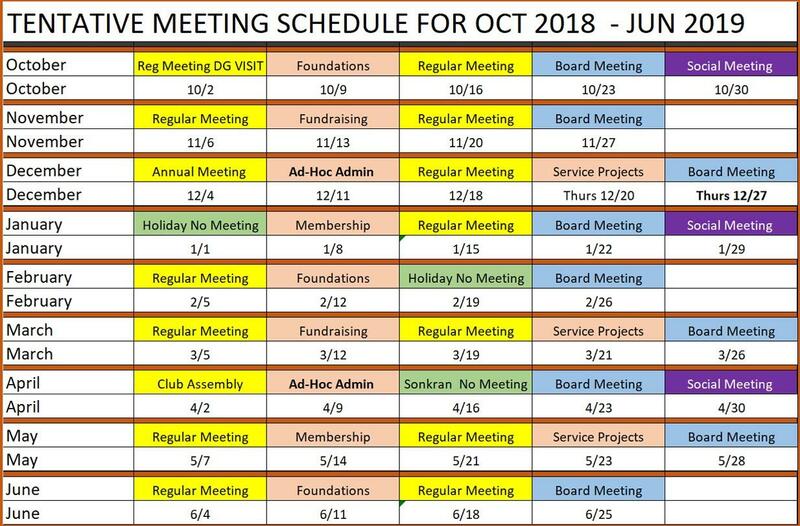 Soon the nominating committee may ask you if you are able and willing to serve on the board for 2019-2018. One last thought, when you are talking with a potential member ask yourself if he or she might have the potential to serve on our board at some future date. Not everyone is comfortable in a leadership position but given the opportunity we can grow. Not everyone will want to take the opportunity to develop as leaders, but some certainly will. We need good Rotarians in both leadership and worker bee roles! On August 31st, the final Friday of the month, some club members gathered at Fern Forest Cafe for a friendly "Let's Talk Rotary" lunch. On September 2nd, club members made their weekly Sunday visit to the BCMF B.K. Kee Patient House with the usual conversation, fun, eating of fruit, bringing supplies and toiletries, etc. 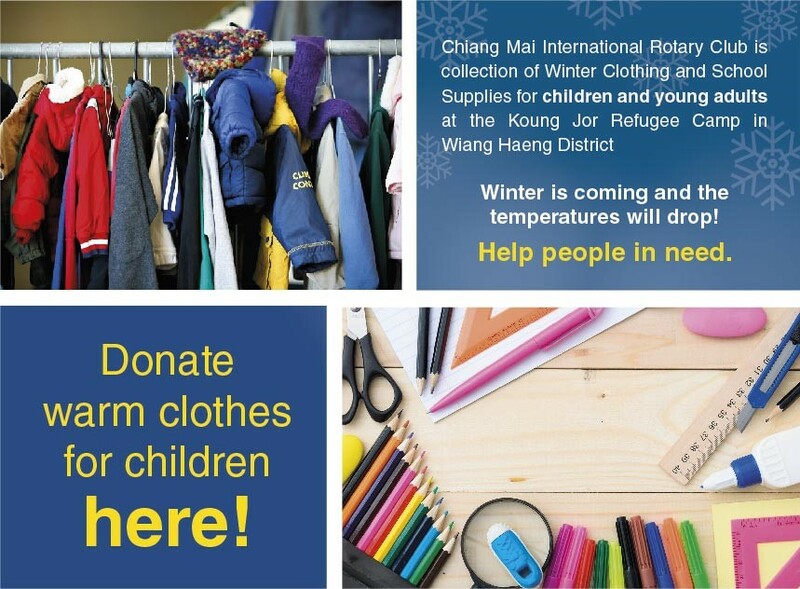 On September 3rd, there was an Annual Winter Clothing Appeal organizational meeting at Hong Kong Lucky Restaurant. This year’s appeal will be led by Rotarian Geoff with help from our club members. On September 4th, there was a pre-induction meeting at My Secret Café in Town where Clarence Shettlesworth had the opportunity to tell club members about himself and where he sees himself being involved in CMIRC. On the September 4th there was a Club Assembly at Hong Kong Lucky Restaurant. On September 9th, club members made their weekly Sunday visit to the BCMF B.K. Kee Patient House with the usual conversation, fun, eating of fruit, bringing supplies and toiletries, etc. On the September 10th, new Rotary Year 2018-19 stand-up club signs were picked up and one displayed in the CMIRC meeting room. Another twin sign is to be used at public events away (pictured left) from our regular meeting location. On the September 11th, there was a Membership Committee meeting at Hong Kong Lucky Restaurant. Our club president, John Schorr, is temporarily chairing the committee but a club member needs to fill the position. On the September 18th, there was a regular club meeting where Paul Carter presented the program on “Thai Forward Air Guides”. On the September 19th the Children’s Water Safety and Drown Proofing Committee met at the Bronco Kids Sports Center. On the September 19th, newly-made District Governor annual visit greeting signs were picked up and put on display in CMIRC meeting room at HKL. 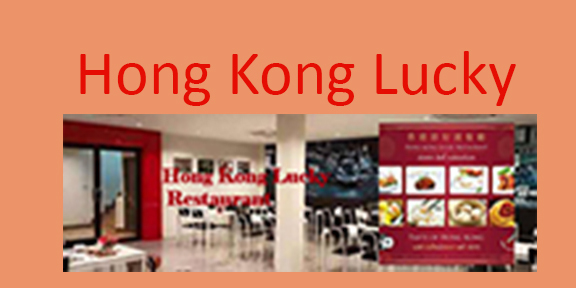 On September 25th, there was the monthly Board meeting at Hong Kong Lucky restaurant. On the September 28th, the final Friday of the month, some club members gathered at Suan Paak Restaurant for a friendly "Let's Talk Rotary" lunch. On September 30th, club members made their weekly Sunday visit to the BCMF B.K. Kee Patient House with the usual conversation, fun, eating of fruit, bringing supplies and toiletries, etc. Pern's Restaurant, a Mediterranean restaurant on Huey Kaew Road, near Central Kad Suan Kaew mall, across from the Shell Petrol station will host our next Social Night on October 30, "From Myanmar to You". 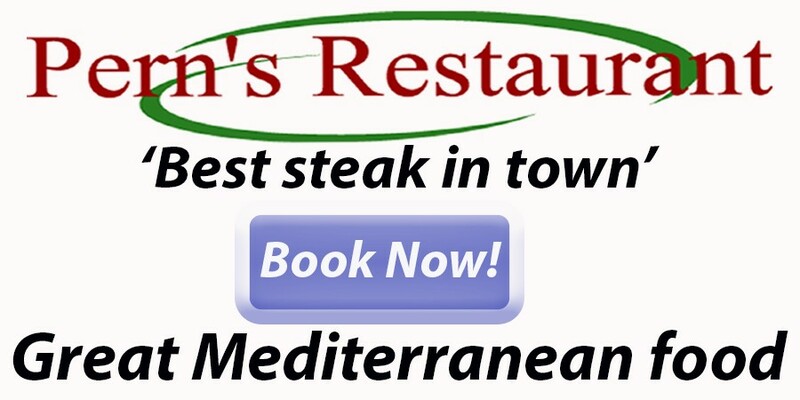 Brian Pern and his friendly staff (including the legendary Micky) create a warm and welcoming atmosphere for diners to enjoy steaks, seafood, chicken, pasta and vegetarian offerings. There are nightly specials and half-price house wine on Wednesdays. Most Wednesday and Sunday evenings you can enjoy smooth jazz while dining. First time diners receive a free glass of house wine when they reserve through Pern's website. Book here. 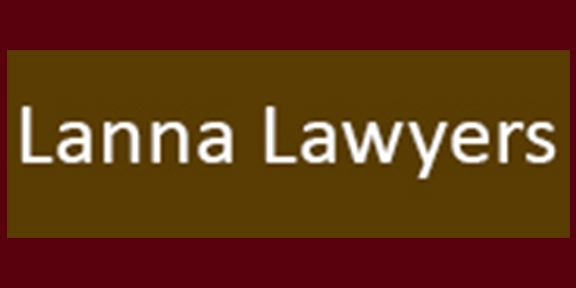 Lanna Lawyers is an expat focused professional general practice law firm in Chiang Mai. They provide detailed and focused legal advice and services to expats and Thai nationals. Specializations include: Family, Business/Corporate, Property/Real Estate, Wills and Estates, Civil, Contract and Criminal Law. Other services include immigration, notary services, translations and accounting. Lanna Lawyers prides itself on the ethical, high quality and standard of care. Lanna Lawyers is a leader in providing pro bono services to a significant number of clients who are both in need of legal assistance and do not have the financial means and ability to pay for them. Fashion King is the best tailor in Chiang Mai. They have been in the same shop for over 12 years and receive the highest ratings from Trip Advisor and others. They feature authentic craftsmanship, superior materials and a great value! Their success is measured in customer satisfaction. The owners, Frank and Vanita will personally guide you through the entire process: design, material selection, fitting and delivery. Frank and Vanita are the sponsors of the famous Chiang Mai fundraising event called “Bollywood Night”. They do a lot to give back to their community, helping the underprivileged in and around Chiang Mai.